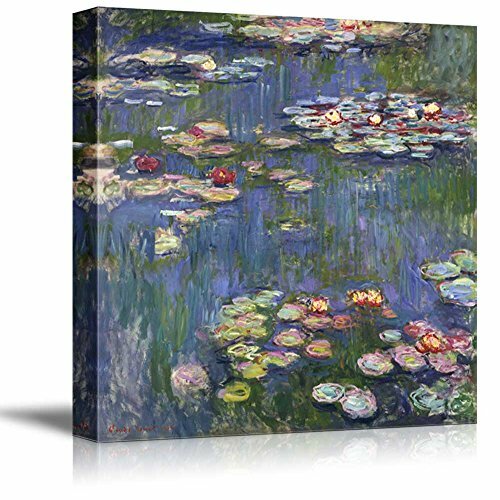 Wall26 - Water Lilies by Claude Monet - Canvas Art Wall Decor - 24" x 24"
I love it. So well done, beautiful and a very reasonable price. This is beautiful! Although the first one came damaged...then the second one I received has a smaller frame than the others I purchased from them. So it’s thinner than the others hanging on the wall. only negative is that the canvas was not stretched tight enough. The colors are warm and intense. The box frame is sturdy and well-balanced. Highly recommended. Very pretty. Just as shown. This painting depicts Monet's garden at Giverny and was painted while he suffered a series of cataracts. There are around 250 paintings of water lilies by Monet, but the color quality, subtle hues, and contrasting shades prove this one to be a great example of his famous series. It is wrapped and framed very well.